September 15, 2006John F. Kennedy Space Center Americas gateway to the universe Spaceport News http://www.nasa.gov/centers/kennedy/news/snews/spnews_toc.html Vol. 45, No. 18 Atlantis, STS-115 return to space station construction (See ATLANTIS, Page 4)NASA selects Lockheed Martin as Orion CEV prime contractorSPACE SHUTTLE Atlantis lifts off at 11:15 a.m. on Sept. 9 for its rendezvous with the International Space Station on mission STS-115.Landing scheduled for Sept. 20 at KSC M oments before the launch of Space Shuttle Atlantis on STS-115, Commander Brent Jett expressed the crews excitement about the mission from his seat inside the orbiter. Were confident over the next few weeks, and few years for that matter, that NASAs going to prove to our nation, to our partners and our friends around the world that it was worth the wait and the sacrifice, Jett said. Were ready to get to work. Atlantis and its six-member crew are docked at the International Space Station after lifting off from Kennedy Space Center at 11:15 a.m. on Sept. 9. The liftoff was the fifth in the launch window after weather and a fuel cell issue delayed previous attempts. Its been almost four years, two return-to-flight missions, a tremendous amount of work by thousands of individuals to get the shuttle program back to where we are right now and thats on the verge of restarting the station assembly sequence, Jett said. The fuel cut-off sensor system, which delayed Atlantis scheduled Sept. 8 launch, performed normally the following day. The engine cutoff sensor is one of four inside the liquid hydrogen section of the shuttles external fuel tank. Atlantis flight resumes construction of the station. The shuttle and station crews will work with ground teams to install a girder-like structure, known as the P3/P4 truss, aboard the station. The 35,000-pound piece includes a set of giant solar arrays, batteries and N ASA selected Lockheed Martin Corp., based in Bethesda, Md., as the prime contractor to design, develop and build Orion, Americas spacecraft for a new generation of explorers. Orion will be capable of transporting four crew members for lunar missions and later supporting crew transfers for Mars missions. Orion could also carry up to six crew members to and from the International Space Station. The first Orion launch with humans onboard is planned for no later than 2014, and for a human moon landing no later than 2020. Orion will form a key element of extending a sustained human presence beyond low-Earth orbit to advance commerce, science and national leadership. Announced on Aug. 31, Lockheed Martin will be responsible for the design, development, testing, and evaluation (DDT&E) of the new spacecraft. Manufacturing and integration of the vehicle components will take place at contractor facilities across the country. Lockheed Martin will perform the majority of the Orion vehicle engineering work at NASAs (See ORION, Page 3) Parsons to be next Kennedy Space Center director N ASA Administrator Michael Griffin named William (Bill) Parsons the new director of the Kennedy Space Center, effective in January. Parsons succeeds Jim Kennedy, who is retiring. Parsons currently serves as deputy director of KSC, a position he has held since February. As Space Shuttle Program manager, Parsons led the returnto-flight activities for the agency and played a major role in the success of the Discovery STS-114 mission. His first stint as NASAs Stennis Space Center director in Mississippi came in August 2002. (See PARSONS, Page 2)BILL PARSONS will become the Kennedy Space Center director in January. SPACEPORT NEWS September 15, 2006 Page 2 Awards The Kennedy Update Jim Kennedy Center Director T he September NASA employees of the month, standing from left, include Matthew Parris, International Space Station and Payload Processing; Gary ONeil, Shuttle Processing; William Riddle Jr., Center Operations; and Christopher Comerford, Safety and Mission Assurance. Seated from left are Dawn Dwyer, Information Technology and Communications Services; Dorothy Davis, Engineering Development; and Penny Chambers, Office of the Chief Counsel. Not pictured is Penelope Hale, Procurement Office.September NASA employees of the monthHe was first assigned to Stennis in 1997 as the chief of operations of the Propulsion Test Directorate. Parsons relocated to NASAs Johnson Space Center in Houston to become the director of the Center Operations Directorate. He later served as the deputy director of Johnson. He returned to Stennis in 2001 and served as director of the Center Operations and Support Directorate. In 1990, Parsons joined the NASA team at Kennedy Space Center as a launch site support manager in the Shuttle Operations Directorate. He also worked as an executive management intern and later as the shuttle flow director of the Shuttle Operations Directorate at Kennedy. In 1996, he became manager of the Space Station Hardware Integration Office at the center. Parsons has received numerous honors, including the Presidential Rank Award (Meritorious Executive); NASAs Exceptional Service Medal and Distinguished Service Medal; and the Silver Snoopy, awarded by astronauts for outstanding performance in flight safety and mission success. Parsons holds a bachelors degree in engineering from the University of Mississippi and a masters degree in engineering management from the University of Central Florida. PARSONS . .(Continued from Page 1) INSIDE THE Launch Control Center, KSC Director Jim Kennedy congratulates the launch team after the liftoff of Space Shuttle Atlantis on mission STS-115. Behind him are (left to right) Shuttle Launch Director Mike Leinbach, Pat Leslie and Robbie Ashley, STS-115 payload manager. B etween typical Florida weather, the launch preparations for STS-115 and the announcement of Lockheed Martin as the prime contractor for the Orion crew exploration vehicle, Ive reached a new level of pride as your director. The greatest space team in the world began this busy time by not only securing Atlantis at Launch Pad 39B to ride out Tropical Storm Ernesto, but by taking the precautions to secure the entire center from any possible damage. Im happy to report that no damage to facilities were reported at KSC or at the Cape Canaveral Air Force Station. The work force hit the ground running after Ernesto, then cautiously stood down as engineers worked issues with antenna actuator bolts and fuel cell 1 on Atlantis. The team displayed that whatever it takes attitude I like to talk about. The STS-115 mission delivered a major structure to the International Space Station, marking the first time in nearly four years that a space station component has been added to the orbiting outpost. This will be one of NASAs busiest shuttle missions in history. Thank you for all that each of you do, and congratulations on another terrific launch! NASA gave the world more exciting news with the announcement of Lockheed Martin as the prime contractor for the nextgeneration manned space vehicle. Using the best of Apollo and space shuttle technology, Orion will fly to the moon as well as service the International Space Station. We are on the brink of an amazing accomplishment as we complete construction of the space station, while also transforming our facilities for the goals of the Constellation Program to launch its first manned flight no later than 2014. We can not look forward without paying respect to the past. NASA joined the world in mourning those lost during the tragic September 11, 2001, terrorist attacks on our Nation. The attacks were intended to tear us apart; instead, they united us. Space legend Rocco Petrone recently passed away, but his legacy at NASA and KSC will never be forgotten. You can read about Petrones legacy, still present today at KSC, in this edition of Spaceport News I was very proud when NASA Administrator Michael Griffin announced Bill Parsons as my successor when I retire this January. Bill has stepped up to the plate and delivered every time NASA has asked and we both look forward to an exciting agenda for the upcoming months. As we look ahead, the next turn of the calendar will bring the annual Combined Federal Campaign (CFC) to the civil service work force. The CFC committee is planning kick-off activities for early October. Weve set a new record each year Ive been director and Im sure you are ready for another banner year. Enjoy the week and Ill be seeing you around the center! SPACEPORT NEWS Page 3 September 15, 2006Lebron reinvigorates Launch Services Program safetyEDDIE LEBRON, chief of the Launch Services Program Safety and Mission Assurance Division, enjoys contributing to the growth of young talent at NASA. He received the NASA Outstanding Leadership Medal for his effect on NASA programs.By Jennifer Wolfinger Staff Writer W hen one of Kennedy Space Centers leaders, Eddie Lebron, received the NASA Outstanding Leadership Medal for motivating his colleagues to achieve high levels of excellence, he experienced similar inspiration in return. Recognition for the accomplishments is definitely an incentive and catalyst for improvement. Its given me a sense of contribution to the nations space program, said Lebron, chief of the Launch Services Program Safety and Mission Assurance Division. The NASA space program is the ultimate dream for engineers. My career with NASA has been exciting and rewarding. It is fun to do what we do. Watching and contributing to the growth of young talent is rewarding and gives us an indication of NASAs emerging, strong work force. The medal is awarded for outstanding leadership which has had a pronounced effect on NASAs technical or administrative programs. Lebron manages and enables the independent mission assurance, quality, safety and reliability that the Safety and Mission Assurance Directorate provides to the NASA Launch Services Program and related spacecraft customers. He also develops different approaches to satisfy the directorates requirements and functions recommended by the Columbia Accident Investigation Board. Lebron strives to bring a new dimension to the divisions functions, resulting in efficient work and significant independent flight readiness assessments supporting expendable launch vehicles. These independent assessments were a critical component in determining residual risk associated with launch vehicle flight readiness, thereby enabling the directorate and the Office of Safety and Mission Assurance management to execute their Certification of Flight Readiness responsibilities, he explained. These accomplishments are credited to the strong team of dedicated professionals within the division, and competent and dedicated individuals of the Launch Services Program. In Lebrons award recommendation, KSC Director Jim Kennedy said: Under Mr. Lebrons guidance, the quality program pertaining to expendable launch vehicles has been reinvigorated and now includes a defined strategy and approach to ensure that the Launch Services Program and its spacecraft stakeholders and customers receive a high-quality launch vehicle that maximizes mission success and assurance. As a result of his efforts and inspiration, the divisions personnel have become a unified team, working together to achieve the highest standard of safety and mission assurance. Lebron previously served as chief of the Joint Performance Management Office and chief of integration within the Institutional Office. Before joining NASA, he worked for the U.S. Army Corps of Engineers and the U.S. Air Force. He balances out his life by spending time with his wife, Yamilette, and adult children Eddie, Zahyra and Vanessa.THIS ARTISTS rendering represents a concept of rendezvous and docking operations between an Orion vehicle and the International Space Station. ORION . .(Continued from Page 1) Johnson Space Center in Houston, and complete final assembly of the vehicle at the Kennedy Space Center. All 10 NASA centers will provide technical and engineering support to the Orion project. The contract is structured into separate schedules for DDT&E with options for producing additional spacecraft and sustaining engineering. During DDT&E, NASA will use an end-item costplus-award-fee incentive contract. This makes the award fee subject to final determination after the contractor has demonstrated that it meets the technical, cost and schedule requirements of the contract. DDT&E work is estimated to occur from Sept. 8 of this year through Sept. 7, 2013. The estimated value is $3.9 billion. Production and sustaining engineering activities are contract options that will allow NASA to obtain additional vehicles as needed. Delivery orders over and above those in the DDT&E portion will specify the number of spacecraft to be produced and the schedule on which they should be delivered. Post-development spacecraft delivery orders may begin as early as Sept. 8, 2009, through Sept. 7, 2019, if all options are exercised. Sustaining engineering work will be assigned through task orders. The work is expected to take place from Sept. 8, 2009, through Sept. 7, 2019, with an estimated value of $750 million, if all options are exercised. Page 6 SPACEPORT NEWS September 15, 2006Space legend Petrone developed Launch Complex 39, VAB PRESIDENT LYNDON B. Johnson (seated at right), NASA Administrator James Webb (center) and Major Gen. Vincent Huston, commander of the Air Force Eastern Test Range, are briefed by Rocco Petrone (left), director of Kennedy Space Center Launch Operations, during a Sept. 15, 1964, visit. Petrone was later named director of launch operations at Kennedy Space Center, then director of the Marshall Space Flight Center before ending his NASA career as associate administrator. D r. Rocco Petrone, who planned and developed Launch Complex 39 before being named director of launch operations at the Kennedy Space Center, passed away Aug. 24 at his home in Palos Verdes Estates, Calif. Petrones career in rocket development began in the early 1950s in Huntsville, Ala., where he participated in the development of the Redstone rocket, the nations first ballistic missile. He was in the blockhouse in Cape Canaveral as a member of the Missile Firing Laboratory when the first Redstone was launched in 1953. Petrone was then detailed to the U.S. Army General Staff at the Pentagon in Washington, where he was assigned duties in the field of guided missiles. While still on active duty with the Army as a lieutenant colonel, Petrone transferred to KSC in 1960 to serve as Saturn Project officer. When the U.S. established its goal of landing a human on the moon by the end of the 1960s, the Apollo Lunar Landing Program was established. Petrone was responsible for planning, developing and activating all launch facilities required for the Apollo Program, including Launch Complex 39 where the Apollo/ Saturn V space vehicles were launched. The complex included the Vehicle Assembly Building, the launch towers, the crawler transporter and the mobile service structure. He was directly involved in all successful launches of the Saturn I and IB vehicles. Following his retirement from the Army in 1966, Petrone became director of launch operations at KSC, where he was responsible for the management and technical direction of preflight operations and integration, test, checkout and launch of all space vehicles, both manned and unmanned. Petrone personally directed the first five human-tended Apollo launches, culminating in the Apollo 11 lunar flight. In 1969, he was named director of the Apollo Program for NASA with overall responsibility for the direction and management of the Apollo Space Flight Program. In 1972, he was assigned additional responsibilities as program director of the NASA portion of the U.S. and the former Soviet Union joint Apollo Soyuz Test Program. Petrone was named director of the Marshall Space Flight Center in Alabama in 1973. During his tenure, he presided over Marshalls role in Skylab, Americas first crewed space station. Petrone then became NASA associate administrator and directed program offices including Manned Space Flight, Space Science, and Aeronautics and Space Technology. Petrone is survived by his wife of 50 years and four children. B eginning at 5 p.m. on Oct. 3, the KSC Fitness Centers will be sponsoring the Intercenter Walk/Run at the Shuttle Landing Facility. The 2-mile walk/run, 5-kilometer run and 10k run are free for all spaceport employees. Stop by either fitness center by September 29 to pre-register, with late registration available at the race. Participants will receive informational packets and a catered dinner, with licensed massage therapists available afterward, as well. The 10-kilometer race can serve as a qualifier for those wanting to participate in a marathon. If you are interested in being a volunteer, call 8677829 or e-mail orrindl@kscems.ksc.nasa.gov 2006 Intercenter Walk/Run at Shuttle Landing Facility set for Oct. 3 THIS YEARS Intercenter Walk/Run event takes place Oct. 3 at the Shuttle Landing Facility. SPACEPORT NEWS September 15, 2006 Page 7 Remembering Our Heritage40 years ago: Operation Big Move gave employees different view during drive to work By Kay Grinter Reference Librarian I n August 1961, NASA announced intentions to expand the Cape Canaveral launch facilities for manned lunar flight. Procedures were established to purchase the land north and west of the U.S. Air Force Missile Test Center for a new space center using the U.S. Army Corps of Engineers as the real estate acquisition agent. In the meantime, NASA and contractor personnel were stationed in numerous local facilities and at other scattered sites, even including one at the Marshall Space Flight Center in Huntsville, Ala. Perhaps most memorable are the Apollo Building, the Holiday Office Complex, and the Cape Royal Building in Cocoa Beach. As construction of the first of the new facilities was completed in 1964, Operation Big Move, the initiative to relocate the space program workers, got under way. A Move Committee was formed to provide general oversight for the relocation and plan the move schedule. Among those chairing the committee were Bill Calhoun and Ray Nething. Move coordinators were appointed to act as liaisons between the committee and their respective organizations. The first facility on Kennedy Space Center property to be occupied was the Central Supply Warehouse in the industrial area. Deliveries could then be made directly onto the center. Occupancy of the Manned Spacecraft Operations Building (now known as the Operations and Checkout Building), Headquarters Building, Central Instrumentation Facility and Vehicle Assembly Building towers followed as construction of each facility was completed. NASA Alumni Robert White represented the NASA Transportation on the Move Committee. Now a volunteer during shuttle launches at the Press Site, he said: I dont mind working weekends occasionally to support a launch. I had to work every weekend for almost two years while the work force was being relocated. We started Friday at the end of the regular work day and worked continuously, even overnight, until Monday morning, White recalled. We tried to move everyone on the weekend for minimal disruption to normal operations. After the in-house move crew received its assignments for the weekend, local household goods carriers were hired on bills of lading to fill the additional requirements. This usually entailed six or seven van lines, 10 to 12 additional trucks and 60 to 70 extra men. Machine shops and laboratories with specialized equipment had to be moved, as well as the normal offices with desks, filing cabinets and computers. Drafting tables were standard in the engineering offices. As White can testify, they were a little heavier and bulkier than the CAD programs used by most engineers on their desktop computers now.THE HOLIDAY Office Center in Cocoa Beach was previously located across from the Holiday Inn on State Road A1A and was home to many NASA sub-contractor offices before Operation Big Move.By Charlie Plain Staff Writer I m flying in a Boeing 727 jet when I suddenly find myself floating through the airplanes cabin. End over end, I spin as the other passengers tumble and burst into laughter around me. Is something wrong? No, I could hardly be better  Im weightless! Zero Gravity Corp. of Fort Lauderdale, Fla., has generously given me a seat on one of its parabolic flights that simulates the microgravity of space flight. The company, also known as ZERO-G, is the only one in the country licensed to offer weightHang time: What it feels like to be weightless aboard ZERO-G less flights to the general public and was cofounded by former space shuttle astronaut Byron Lichtenberg. NASA provided ZERO-G with technical information on how to fly weightlessly and recently inked a deal to complete research flights with the company. The gravitydefying flights use parabolas, special flight patterns in which the jet makes a steep climb and then smoothly pushes over into a shallower descent to create 25 seconds of weightlessness. A member of ZERO-Gs coaching team shouts, Five minutes! Thats our cue to leave the seats and move out into the tumbling area of the cabin. Teachers with experiments rush to unpack their gear and get ready for the first parabola. The parabola is designated Martian-1 because it will simulate gravity on Mars, which is about two-thirds less than Earths gravity. Everyone lies down lengthwise along the cabin floor just before the plane begins its first steep climb to 32,000 feet. Ive felt the push of gravitational forces or gforces squeeze and press my body on roller coasters, but what will reduced gravity be like? Forty short seconds later, the pilot calls out, Pushing over. Weve crested the top of the climb and the plane begins its first 25second dive to 24,000 feet. Like someone magically flipped a switch, I feel instantly lighter. Its as though my body is now filled with helium. Another of ZERO-Gs coaches exclaims, Stand up! Stand up! I jump to my feet, but it takes more than twice as long to land on them! After half a minute of hopping around like giggling space bunnies, were told, Feet down, coming out, meaning the 727 is about to complete its initial descent and begin climbing again. The group quickly returns to the floor and prepares for the returning g-forces. 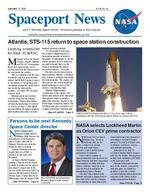 Page 8 SPACEPORT NEWS September 15, 2006 John F. Kennedy Space Center Managing editor. . . . . . . . . . . . . . . . . . . Bruce Buckingham Editor. . . . . . . . . . . . . . . . . . . . . . . . .Jeff Stuckey Copy editor . . . . . . . . . . . . . . . . . . . . .Corey Schubert Editorial support provided by InDyne, Inc. Writers Group.NASA at KSC is located on the Internet at http://www.nasa.gov/centers/kennedyUSGPO: 733-049/600116 Spaceport News Spaceport News is an official publication of the Kennedy Space Center and is published on alternate Fridays by External Relations in the interest of KSC civil service and contractor employees. Contributions are welcome and should be submitted two weeks before publication to the Media Services Branch, IDI-011. E-mail submissions can be sent to Jeffery.Stuckey@ksc.nasa.gov. Hispanic Heritage Month luncheon celebrates Americas future K ennedy Space Center will observe Hispanic Heritage Month from Sept. 15 to Oct. 15. The theme is Hispanic Americans: Our rich culture contributing to Americas future. The month celebrates the contributions Hispanics have made to NASA and the nation. The Hispanic Employment Program Working Group will host its 21st-annual Hispanic Luncheon from 11:30 a.m. to 1 p.m. Sept. 29 at the Kurt Debus Conference Center. The festive event will provide delicious Hispanic food and live cultural entertainment. Guest speaker Miguel Rodriguez is acting director for the Rocket Propulsion Test Program Office at Stennis Space Center in Mississippi. Last years event was a sellout, so purchase tickets early. Entrance to the conference center will require attendees to comply with checks by security personnel. Luncheon tickets cost $16 and can be purchased from these employees: Joe Tellado, Space Station Processing Facility, room 3002Q, 867-6064; Lydia Del Rio, Headquarters Building, room 2223A, 867-4969; Lerma Nelson, Operations Support Building, room 5101F, 861-4187; Lina Rosada, Center for Space Education, room 1000, 867-2959; Gladys Morales, Cape Canaveral Air Force Station I Annex, room 210D, 476-4022; and Rosaly Santos-Ebaugh, Operations and Checkout Building, room 5218Z.THE HISPANIC Heritage Month Luncheon hosted a sold-out crowd last year at the Kurt Debus Conference Center. Aside from delicious Hispanic food, the 21st annual event features live cultural entertainment. T he Federally Employed Women Space Coast Chapter has chosen the Brevard Sharing Center as the groups project for Make a Difference Day. All collection centers are low on food and basic essential items. The group is asking spaceport co-workers and friends to donate to this cause and will be gathering donations at the sites listed below until Oct 26. Items that are needed include canned soup, toothpaste and toothbrushes, canned vegetables, Federally Employed Womens Make a Difference Day benefits Brevard Sharing Center shampoo, soap, canned meat, peanut butter and jelly, shaving cream and razors, macaroni and cheese, packaged rice meals and other non-perishable food items. Donations can be made through any of these people at the following locations: Linda Maust, Headquarters Building, room 1114A, 867-2455; Sandy Eliason, Launch Control Center, room 4P23B, 861-9309; Ana Cortreras, Operations and Checkout Building, room 1066, 867-1442; Brian Luther, Operations and Support Just a reminder . Building I, room 5301B, 861-3837; Dawn Partlow, Hangar E&O, room 2030G, 853-3168; and Sandra Getter, Engineering Development Laboratory, room 203, 867-6951.CENTER DIRECTOR Jim Kennedy (left) recently visited the North Brevard Sharing Center to hear about the facilitys needs.